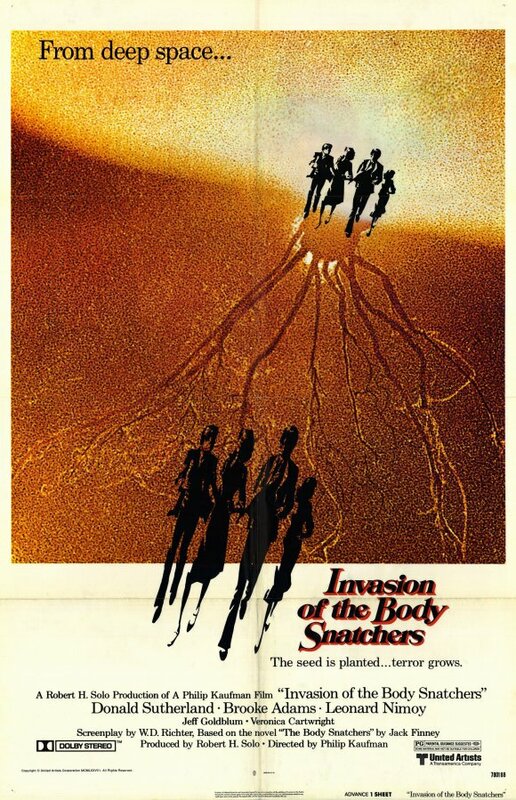 Invasion of the Body Snatchers. United Artists 1978. I don’t normally like to see remakes before the original. When I do see the 1956 version, hopefully this won’t color it too much. However, the reason this is line-jumping is because I wanted to respect the death of Leonard Nimoy and this has turned out to be pretty much the only work he was involved in available to me that I haven’t seen and is a movie. At any rate, this is billed as a “reimagining”, and appears to do a decent job at making the story relevant to the late 70s, which is always a problem when remaking science fiction decades later. I take it from the recommendation that brought this to my attention that Nimoy’s role is fairly significant, though I don’t know much about his star capital between Star Trek leaving television and entering theaters to judge whether he was a big enough name to get on the poster for minor roles. I don’t want to make this post all about Nimoy, but it occurs to me that I may never have seen him play an onscreen role besides Spock. One morning, San Francisco Health Department worker Elizabeth Driscoll wakes up to find her boyfriend isn’t the same man anymore, now distant and elusive. Convinced there’s been a change in him, she follows him and sees him having odd meetings with random people in random places, and suspects a conspiracy. Her colleague, Matthew Bennell, suggests she talk to his friend the psychiatrist Dr. David Kibner, who in turn suggests the rash of people believing their loved ones are impostors is a psychological sign of the times. But then Matthew’s friends Jack and Nancy Bellicec find a body in their bath house that looks suspiciously like Jack. This is certainly a powerful example of horror, though I’m not sure what the root fear is. The original is well known to be an allegory for Communism, which was still considered a threat by the late 70s, but not nearly so panic-inducing. I wondered for a while if it was drug culture, due to how heavily the plant imagery is laid on, but it’s a little late for that as well, and the plants are more likely just a vivid realization of the pod biology, a more visible threat than a human acting oddly. I’ve seen arguments for the allegory being creeping conservatism, which is appropriate to the era but I didn’t see at the time. The pod people’s manifesto of “everything will be much better if humans just relax and let us assert the Way Things Should Be” can indeed be applied to the worst of conservatism, but it also wouldn’t be out of place in a critique of communism. As ever, extreme opposites in ideology mirror each other in enforcement. I guess the biggest clue is that an authority explains away the unease about changed loved ones as a symptom of the erosion of traditional values, which I originally thought may have been the thesis of the movie, but now I see as a depiction of conservatives blaming liberal permissiveness for modern problems. The film seems a little muddled on who the main protagonist is. Elizabeth makes a lot of the necessary discoveries and feels like the emotional center, but Matthew is the heroic problem solver. Sutherland and Adams carry the movie between them, putting in some splendid work but buoyed by an equally talented supporting cast. Goldblum is very effectively placed to do what he does best, and Nimoy is… unsettlingly reassuring? I know he’s had many non-stoic roles, but I haven’t experienced them, so the effect of emotionality where it shouldn’t be enhances the character’s function. However, at least as important as the actors’ performances is everything that’s happening with technique. The cinematography, score, and sound effects are all working hard to keep everything creepy. Judicious use of handheld camerawork, wide lenses, possible subtle dolly-zooms (the Vertigo effect), and jarringly unconventional edits are all on display. The creature effects are almost at the height of what practical effects can accomplish, and at least as sinister as the inhuman acting. I think the music is entirely electronic (aside from a use of Amazing Grace and perhaps one other song), and nearly always dissonant. The sound design of the pods and pod people is haunting, and in the end, the credits are totally silent, to leave the audience alone to contemplate the story that’s been inflicted upon them. There are doubtlessly movies out there with more of Leonard Nimoy in them, but not many of them could possibly be as classic or resonant. It is quite fitting to commemorate him with, instead of a great Nimoy film, a great film with Nimoy.